You won't find many chain restaurants on this block. 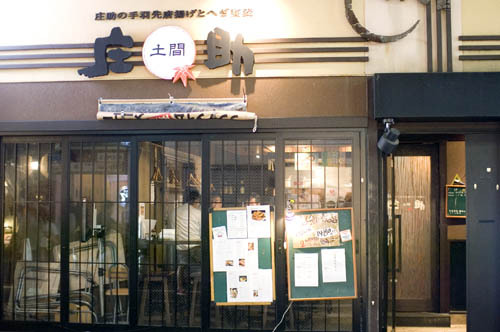 Unlike the crowded, higher-rent districts nearer Shinjuku station, this slice of 3-chome west of Meiji-dori has long been the home of quirkier and more independent eateries. A nurturing ground for the chain shops of tomorrow, perhaps, thanks to its combination of moderate rents and relatively easy accessibility to masses of commuters. Recently the area has been going through a revival, as hard-core mom-and-pop joints from decades past are joined by glitzy new neighbors. Fitting right in with this trend is the newly spruced-up Shousuke, a design-heavy yakitori-ya that caters to a generation of diners who are style- as well as value-conscious. Shousuke is a spacious, two-story affair - downstairs there's a big sushi counter, and upstairs are several semi-private booths for two, four or more, separated by bamboo blinds for privacy. The decor is tasteful Japanese modern, with polished wood surfaces and subdued lighting. Given the very pretty setting and the modest menu prices, we were quite unprepared for the quality of the food, which is simply spectacular. None of the many dishes we sampled was anything less than outstanding. Our assorted sashimi starters were fresh and flavorful, and good value for money; the chuutoro tuna was especially good. The charcoal-grilled chicken and vegetables were uniformly top-notch. Favorites included the tsukune - moist and crunchy with mixed-in bits of nankotsu (cartilage); the tender, charcoal-flavor-infused sasami (breast meat) complemented by either wasabi or ume paste; and the sweet-ish stewed pork (kakuni), slow-cooked till every bit of fat has melted away. The uni sushi was some of the best we've had in ages, and sweet enough that it could almost be served for dessert. Although there's a de rigeur katakana-French wine list, sake and beer are probably better matched to the food; the menu lists 13 relatively unusual sakes, plus draft Suntory Malt's beer (at Y1800/pitcher). 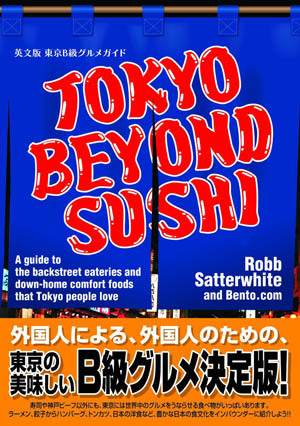 A budget of Y5000 should cover ample food and drinks, although it could run to more if you order lots of sushi. The BGM is heavy on old-school jazz vocalists, a bit of a break from the instrumental jazz and Brazilian mood music in every other shop in town.